Did you know that a few years back February 5th was declared World Nutella Day? Cheer and celebrate all you like, but I’ll pass. While I won’t subject you [again] to my very strong opinions on the ingredient list of Nutella you are more than welcome to catch up on last year’s rant over here. But wait, don’t go! It isn’t all gloom and doom, as my stand against World Nutella Day simply takes the form of yet another Nut-tella-type Chocolate Spread, providing an alternative to cups of sugar and gallons of palm oil. Last year, inspired by my Banana Split Spread from a few months earlier, I packaged up my rant into a jar of Nut-tella-type Choc-Hazelnut Spread. This year, while I was tempted to make another Choc-Hazelnut spread, I instead went for the huge bag of macadamia nuts in my crisper. Now I pretty much cook by feel and instinct, making things up as I go along. And while it works most of the time there is the occasional fail… and the first two goes of this spread were a prime example. I persevered however, and not only ended up with this wonderful creation but have come up with at least one [if not two!] other treats using the messy, yet luscious, leftovers. I should note that this recipe originally appeared in the Australian Macadamias 2013 calendar. I had submitted it from the so-low-it-was-on-the-floor platform bed in a way-too-LA-for-its-own-good hotel room during our recent trip – and it ended up as one of the winners! Australian Macadamias made and photographed the recipes for the calendar, but you just know I had to do it again myself and share it here. World Nutella Day was the perfect excuse. And as I had calendars on the brain I figured I’d take the opportunity to make a printable. 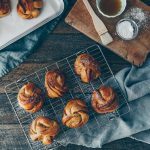 Yes, I know it’s nearly a week into February but it was far too early to do one for March, and besides this is a February recipe. Also, I just felt like it. I even made a Hitchcock cameo in the jar, let’s pretend it’s on purpose. You can click on the above image, or on the button to the left, or right here to download the free calendar page! File size: 1.8 MB, includes pdf and jpg formats. Please note: This pdf calendar printable is free for personal use. If you’d like to share it, please link back to this post with proper credit, do not sell or distribute. Thanks! 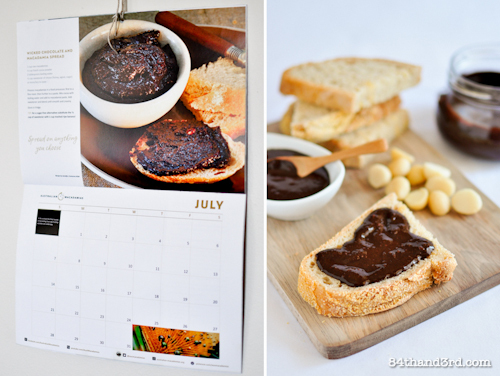 Are you a fan of chocolate on bread – Nutella or otherwise, and what do you think about a new calendar each month? 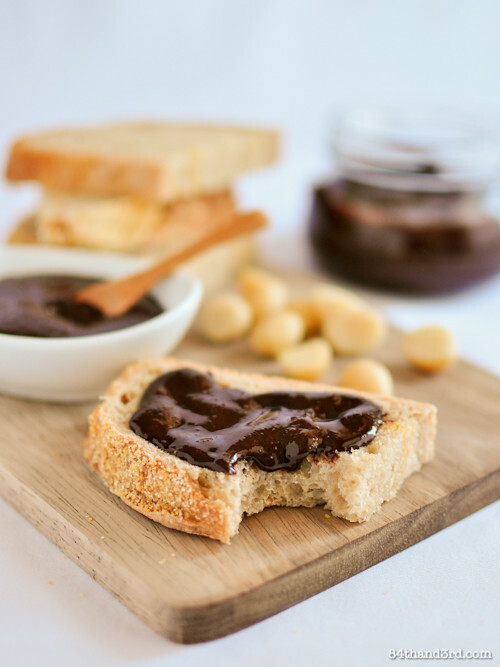 A new Aussie Not-tella twist on Nutella -- with no nasties! Blend nuts, salt and sugar in a food processor until smooth and creamy - be patient and do not add any oil! Stir in cocoa powder so it doesn't fly every where, then blend again until well combined. Store in fridge indefinitely. Use on everything, I highly recommend thick slices of No-Knead Bread. I had two batches of this spread split on me while making it and I think liquid combined with the oil released from the macadamias was the issue. On the first batch, mixing the cocoa with 2 Tbsp of hot water to create a paste was fine, but when the rice syrup was added to the processor it caused a split. The second time sugar was dissolved in the hot water with the cocoa to create a chocolate syrup, that had pretty much the same effect on blending. Perhaps stirring in by hand would solve the issue, perhaps blending for longer would do it. But I was not sure, and after recently burning out one food processor and being down to my last cup of macadamias, I went for the safe option on this one. New moral of the story, use any sweetener you wish -- even syrups -- and if it splits simply refrigerate till cold and blend once more. Science and magic, or something like that. Panela and Rapadura are unrefined sugar from evaporated cane sugar, it is also found as Jaggery and is sold in blocks or granulated form. Coconut sugar will work as well. The finer the sugar the smoother the spread so if using dry sugar instead of syrup it's an idea to blend it first to make it really fine. I’m all for an all-natural Nutella spread! Yours looks irresistible! Oh yeah! Def a great alternative to the other stuff. And macadamias rock! It’s also less work-I can never be bothered with hazelnut skins. Hum, very good point, I always forget about the skins until I go to use hazelnuts! I’ve been meaning to make my own chocolate spread for a while now. This looks easy enough for me to actually give it a go. Added bonus … I actually have all the ingredients. Thanks. 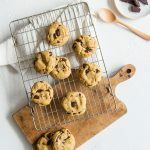 I am so thrilled to have discovered you guys on pinterestThankyou for sharing-choc on! Aww thanks Lynette! Hope you enjoy! I’m a big fan of Nutella so something tells me I’d really like this. Especially when you use my favourite nut! 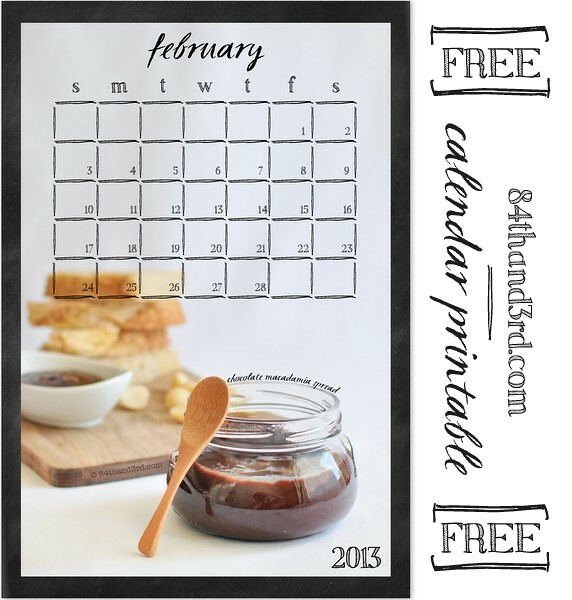 Oooh, looks so delicious… and thanks for the printable calendar – your pics are just gorgeous! 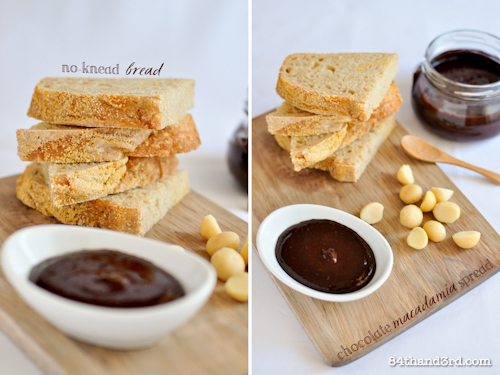 We were thrilled to include your Chocolate Macadamia Spread in the 2013 Australian Macadamia calendar. Your pics look fantastic and my mouth is watering…..time for lunch! Yum, this is incredible! I love a good rant too, especially when food related. High five! 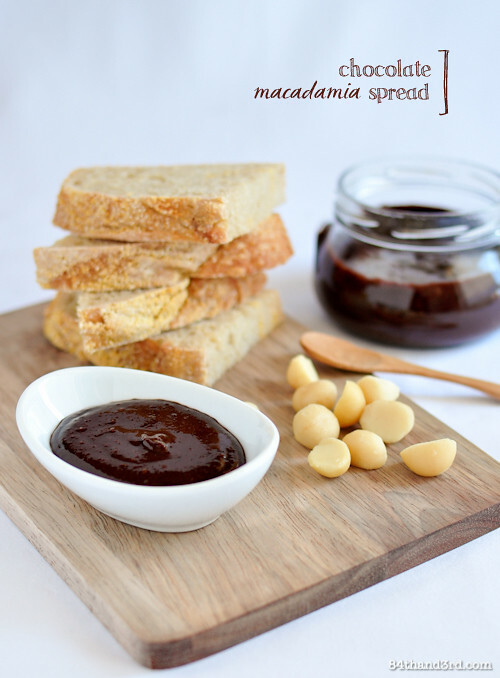 I adore macadamia spread. A chocolate version….heaven. Must try this for sure. It looks and sounds divine. As for your rant, keep it up! 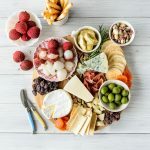 The more people start to take note of what is in the jars and packets of food they are opening and consuming the better!! A calender is a great idea JJ. I’ve had the same problem with using high fat content ingredients and adding high water content sweeteners like rice malt. One of the solutions is mixing in the sweeteners into cooled fats, the other is to use soy lecithin as a stabilizer, or doing what you did. 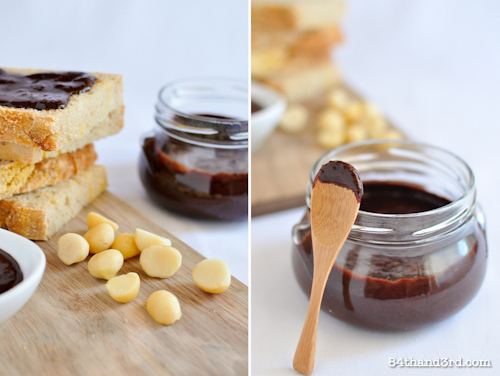 PS love homemade macadamia butter, so quick and easy and paired with choc, can’t go wrong! Ah, interesting, the macadamia spread was quite warm from the processing, I wonder if it was chilled before adding in the syrup if it would work? May need to try that some time, Thanks! Great post! I’d love to try it. Next time I see some fresh macadamias I’ll gie it a shot. I can see why it made it to the calendar. Well JJ, thanks to you I now know there is a Nutella Day? Serious? I think we should have a world Violet Crumble Day, because I really like them, just for what they are. Well done, but I think your pics are way better than their official calendar ones. Plus recipe is one I really want to try. Sort of the Aussie Nutella? 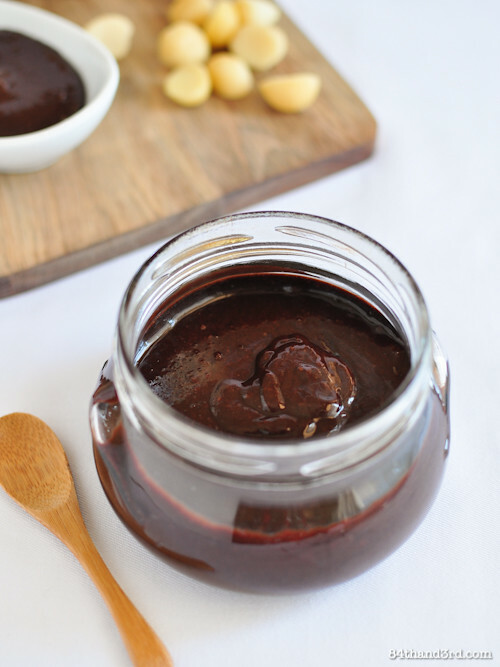 Aussie Nutella – LOVE IT!! happy nutella day for yesterday. 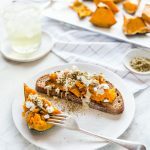 what better way to celebrate than making your own healthy spread! well done and didn’t realise it was that easy to make your own version? genius idea!